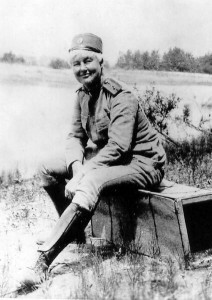 Flora Sandes was the only British woman officially to serve as a soldier in World War I. Initially a St. John Ambulance volunteer, she travelled to Serbia, where she enrolled in the Serbian army. Flora was the daughter of a Suffolk rector but was set on becoming a soldier; spending her childhood charging through the countryside and pretending she was fighting. It is said that she enjoyed riding and shooting and even that she wished she had been born a boy. Born in 1876 in North Yorkshire, she was the youngest of eight children, and moved with the family to Suffolk when she was nine years old. Her childhood was typical of middle-class girls at that time, with a governess and time at finishing school, but in adulthood she chose adventure ahead of the life that was mapped out for her as a mother and wife. Flora trained as a stenographer and used her wages, and a legacy from a rich uncle, to fund her travels. She worked in Cairo, visited British Columbia and worked her way across America. When Flora was 38 years old and living in London, Britain declared war on Germany. To begin with she worked with the Red Cross and worked in an ambulance for the Second Infantry Regiment of the Serbian Army. In November, 1915, the Serbian Army was unable to stop Austro-German and Bulgarian forces advancing deep into Serbia and Flora signed up with the army itself. The Serbian Army was one of the few to accept women and Flora felt at home with the other soldiers. She quickly advanced to the rank of Corporal and later to Sergeant Major. At one point she was seriously wounded by a grenade and received the highest decoration of the Serbian Military, the Order of the Karađorđe’s Star. During WW1, and in order to raise money for the Serbian Army, she published her autobiography, An English Woman-Sergeant in the Serbian Army. She had reached the rank of major by the time she retired. Flora did eventually marry, to a White Russian officer who had been one of her sergeants, and they moved to what was Yogoslavia. In 1927 she published a second autobiography, The Autobiography of a Woman Soldier: A Brief Record of Adventure with the Serbian Army. In 1941, following the German invasion of the country and by then aged 65, Flora and her husband were recalled to fight. It took only 11 days for the Germans to defeat the Yugoslav army and occupy the country. Even though Flora never saw action this time, she was imprisioned by the Gestapo. After the war, her husband having died in 1941, Flora was alone and penniless and went to stay with her nephew in Jerusalem and then Zimbabwe. She returned to Suffolk where, after a brief illness, she died aged 80. Flora has been largely forgotten here in the UK, though there is a pub in her name in Thornton Heath, but not in Serbia where she is still celebrated. Our Englishwoman, a television film based on the biography of Flora Sandes and directed by Slobodan Radovitch, was produced in 1997 by the Serbian broadcasting service.